Let me preface this by saying Gary Sanchez has had an abysmal season. A worst case scenario season, really. He’s been on the disabled list twice, and, when healthy, he’s hit .180/.280/.386 (80 wRC+) in 357 plate appearances. There have been 1,005 individual player seasons of at least 300 plate appearances in Yankees history. Sanchez’s .180 batting average ranks 1,004th. Only someone named Red Kleinow was worse. He hit .168 in 1908. Sanchez has had a terrible season at the plate and a bad season behind it, particularly blocking the ball, and he is one of the single biggest reasons the Yankees are fighting for home field advantage in the Wild Card Game in the final week of the regular season rather than enjoying a big lead. 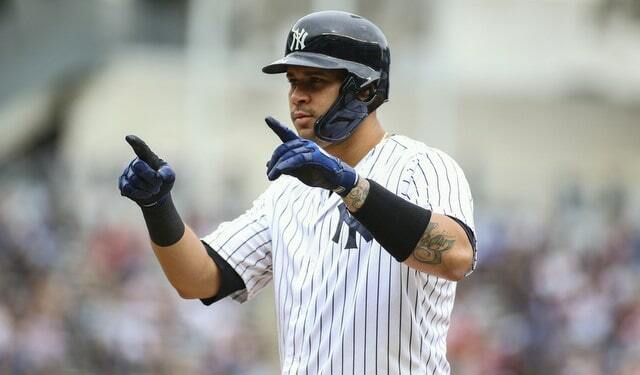 I was hopeful Sanchez would return from the disabled list looking like 2016-17 Gary Sanchez. Instead, he’s 10-for-66 (.152) in 19 games since returning. Given his season to date, it is perfect reasonable to question whether Sanchez should start the Wild Card Game one week from tomorrow. Austin Romine isn’t great by any means, but he’s better at blocking pitches, and he actually has Sanchez beat offensively this year (93 wRC+ vs. 80 wRC+). Is he the better player at this moment? He might be. The case can be made. The Yankees aren’t hearing it though. Sanchez will start the Wild Card Game. Over the weekend Aaron Boone gave a very succinct “yes” when asked whether Sanchez will start the Wild Card Game. “Hopefully there is that stretch in him where he really gains some momentum with some good and positive at-bats where he gets some results and then it can kind of snowball from there because of who he is as a hitter,” Boone told Laura Albanese another day. Barring injury, Sanchez will be behind the plate next Wednesday. Sanchez is unquestionably the most talented catcher on the roster. Is he playing up to his potential right now? Oh hell no. Not even close. But the ability is there and he’s capable of doing things at an elite level moreso than any other catcher on the roster and moreso than most catchers in the game. The offensive potential does not compare — Romine is hitting .210/.255/.370 (65 wRC+) in 197 plate appearances since June 1st, which is in line with his .228/.270/.330 (56 wRC+) line from 2016-17, so let’s not pretend he’s something he’s not at the plate — the throwing arm doesn’t compare, and over the last two seasons the pitching staff has allowed fewer earned runs (3.42 ERA vs. 4.14 ERA) and a lower opponent’s OPS+ (94 vs. 105) when Sanchez is behind the plate. Because he’s the better catcher. It’s not rocket science. It’s baseball. Sitting Sanchez for Romine (or Kyle Higashioka!) is not the same thing as sitting Brett Gardner for Andrew McCutchen. The Yankees wouldn’t be sitting a slumping player for a comfortably above-average player. They’d be sitting a slumping player for a backup who doesn’t really do anything well. Sanchez isn’t doing anything well right now either! But I am much more comfortable expecting him to do something productive than any other catcher on the roster. Gary has been awful this season. Inexcusably awful and he should be embarrassed by his play this year. If this doesn’t get him motivated going into next year, nothing will. If this doesn’t get him motivated going into the postseason, nothing will. There’s nothing Sanchez can do to save his regular season now. There’s no saving that batting line with six games to play. But the postseason is a fresh start and a chance for redemption. That’s the only way Gary can look at this season now. Truth be told, the Yankees do not have a starting caliber catcher right now. Sanchez hasn’t played like one all year and Romine didn’t play like one while Sanchez was on the disabled list. Given that, I think the Yankees should go with their most talented player, the one you know has a chance to be an impact player because he’s been an impact player in the recent past. Put you best players on the field and if you lose, you lose. But at least the Yankees would’ve been in the best position to win.